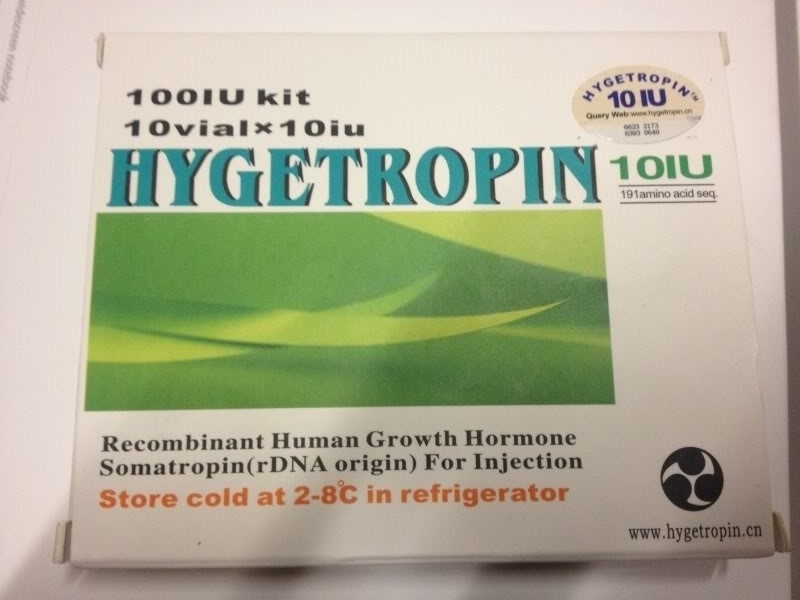 Hygetropin 10IU is the recombinant growth hormone somatotropin (STH). It is one of the most demanded drugs among the sportsmen thanks to its ability to start powerful processes of anabolism in organism providing qualitative expressed growth of muscular fibers while burning fat layer very well. It is hard to achieve such an effectiveness using only anabolic steroid drugs. With anabolics including Hygertropine it is possible also to accumulate muscular mass and get relief at the same time. Growth hormone is also one of the most effective means in case of age-related changes of the organism; it launches tissue regeneration process and also activates the cellular growth. The drug doesn’t have alternative means yet that are able to cause muscular tissue hyperplasia at athletes after age 40 for whom it is practically impossible to achieve such results with anabolic steroids. In bodybuilding growth hormone is one of the best investments into your appearance, witout the risks of androgenic effects and the necessity to apply after-course therapy. Hygertropine, having high effectiveness practically doesn’t have side effects and also doesn’t affect the potency and the muscular sexual function. - improves bones, stimulates their growth (with the condition that the bone growth zones are not closed yet). Producer: Zhongshan Hygene Biopharm Co. (China). Production form: flask 8 IU. 1 ampoule of Hygetropin contains 3,3 mg of growth hormone (this corresponds to 8 ME). Hygetropin is in form of sublimated white powder for injection administration. Preparation dosages may be different, depending on your aims. For the accumulation of tough, dry and qualitative mass it is necessary to inject 8-10 IU two times per day during two days, then one day to have rest, during at least two months. Combining hygetropin with anabolic steroids it is possible to achieve colossal results excellently keeping the accumulated mass. According to the standards, 1 mg of somatotropin hormone is equal to 3 international units (IU) with error of 10%. Preparation purity and also the conformity with the declared level of IU by producer may be defined with STH test. For the sportsmen who use Hygertropin it is important to consider that the secretion of growth hormone has its splashes during the day (every 3-5 hours). The biggest secretion of somatotropine happens during the night, approximately one hour after the sleep. That’s why a good sleep is necessary for the maximum effectiveness of the preparation and also to include protein, sports vitamin supplements, glutamine and creatine to your diet. Anti-counterfeit protection system: each package of Hygertropin has a sticky label with the code that can be checked on producer’s official website and confirms the originality of the preparation.